When you’ve gone to the effort and expense of creating a beautiful outdoor environment for your Fort Worth home, there’s no reason for that beauty to disappear when the sun goes down. Let Blooms Landcare show you how outdoor lighting can showcase your home’s exterior and landscape 24 hours a day. Strategically placed outdoor lights not only highlight your home’s style but enhance the security of your home too. The secret to an effective outdoor lighting installation lies in choosing the right fixture for the right application and location. Determining the best product to enhance the function and style of your yard or garden takes the skill of a talented professional experienced in landscape design. From bullet lights and wash lights to garden lighting, a Blooms Landcare lighting expert can help you choose the best products to illuminate the exterior of your home. 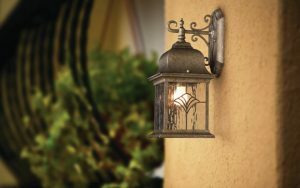 When it comes to decorative outdoor lighting, placement is everything. Flood lights are ideal for highlighting a landscape feature like a statue or fountain, but it takes skill to illuminate the feature without creating harsh shadows. Illumination from a down light filtering through a tree’s canopy creates the illusion of moonlight. A well light placed at the base of the same tree draws attention to the tree’s sculptural quality. Lighting design is an art as well as a science. Outdoor security lighting can be woven into the overall exterior lighting scheme to enhance the security and safety of your home and your family. Would-be home intruders are less likely to choose a home that would put their actions in full view. A well-lighted home not only discourages break-ins but lets you easily indentify strangers outside your home. Outdoor lighting makes your home safer for guests as well, illuminating the path from the curb to your front door. With a Blooms Landcare outdoor lighting installation in Fort Worth, you’ll enjoy the peace of mind that comes with knowing that you are secure and safe within your own home as well as the pleasure of enjoying your home’s outdoor areas day and night. Our lighting professionals ensure that outdoor lighting works as well as it looks, with products that will enhance the beauty and functionality of your home for many years to come. Call Blooms Landcare today at (817) 688-5352 and discover how outdoor lighting can light up your home with style. You can also contact us online.